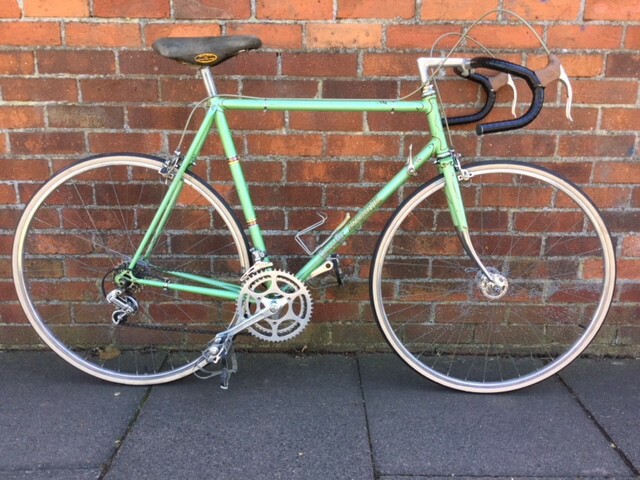 Just because you may have come into ownership of a really lovely vintage road bike, it doesn’t mean to say restoring it will be a series of happy moments. Looks are deceiving. Sometimes, the most wretched looking bikes prove to be easily rebuilt and put back on the road again. This Anquetil, for its charm and aesthetic beauty, turned out to have some tricky problems and challenges, which caused me some bloody fingers and rather a lot of cursing. Nevertheless, it turned out to be a rather beautiful bike, for all its resistance to its make-over. The nut sits on a small red bridge, the ends of which are the distinctive two red circles on each side of the body. Now, when the nut is loose, that red bridge moves easily from side to side, and you can move it laterally by pressing it from these little extensions on the the sides. In this case, ( check the picture above ), the bridge was not centred within the brake body. This meant that a standard 8mm socket could not get a grip on it, as the metal edges of the brake body were in the way. This can happen very easily when installing, and I have to say, is a real pain when you’re trying to get them out. The 600 Arabesque rear derailleur is a excellent performer, moving across the 6 speed freewheel with ease and good precision. Even at this juncture in the early 1980’s, the Japanese brand was not just aping its European superiors, it was putting a lot of thought into innovation and new mechanical ideas. They were trying to leapfrog the likes of Huret and Simplex by technology, but were still bowing in admiration to the traditional architecture they were building upon. Hence the florid designs of this derailleur. Yet, they were adding smart features like the “hatch”, a button that released part of the cage for better access to the derailleur. Interestingly, the crankset on this 1980/81 Jacques Anquetil isn’t an Arabesque. 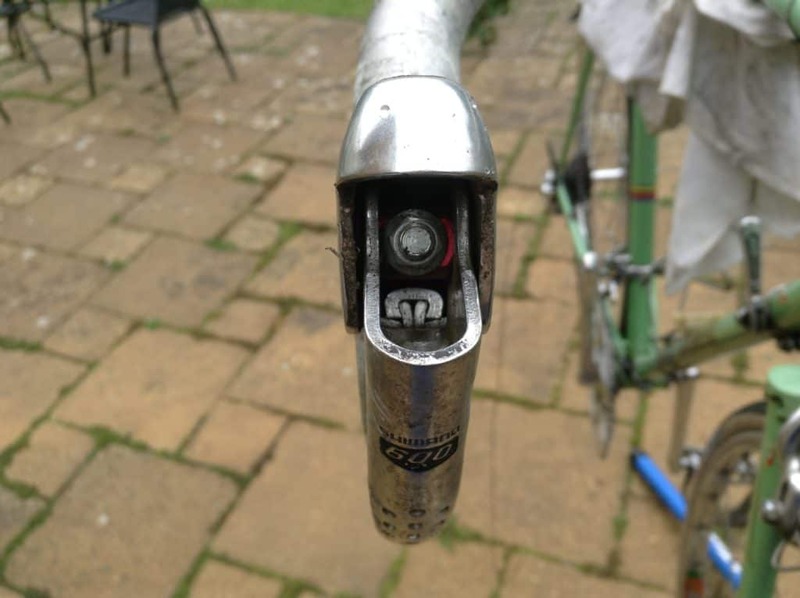 It is actually a 1st Generation Shimano 600. That’s pretty cool, and I don’t know how a crankset that was produced in 1975/76 came to be on this bike which was built 4 years later. It’s a lovely crankset, even though it doesn’t have the classic 5 armed spider, and weighing in complete at 722 grams, was heavier than its rivals. Indeed, this 3 arm crank has a simple modesty about it, even a kind of humility in the face of its venerable Euro competition. However, it was nearly impossible to get this bloody thing off. At first, I just left the drive-side arm on and released the chain rings for cleaning. That’s a good way to approach cleaning a stubborn crank. However, I didn’t give up on it. I had to get this crank off. For many rotations of the crank puller, using such force that the bike stand was nearly toppling with each push, this crank refused to come off. I got really flustered. Angry. “Oh come on, this is ridiculous” I said out loud to no one at one point. The puller had barely any threads left to continue, but..yes, on the final possible rotation, it slipped away. I looked at it inquisitively, and saw the problem. There’s a metal sheath which the puller had to strip through to reach the spindle, and this was the resistance which was forcing endless hernia-inducing rotations to push it out. 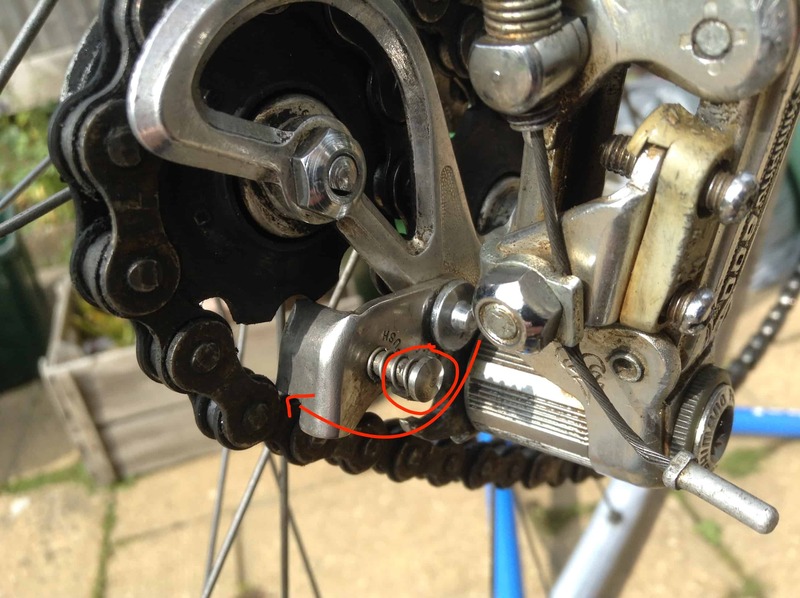 The puller tool must have only made contact with the bottom bracket spindle near the end of its threads, and this caused the back breaking effort for getting this crank off on both sides. So did Shimano not think of this? The hubs, brakes and derailleurs on this bike were all in good condition, good enough that they didn’t need anything more than a clean with a brush and soapy water. Most parts didn’t even need removing to do this job. 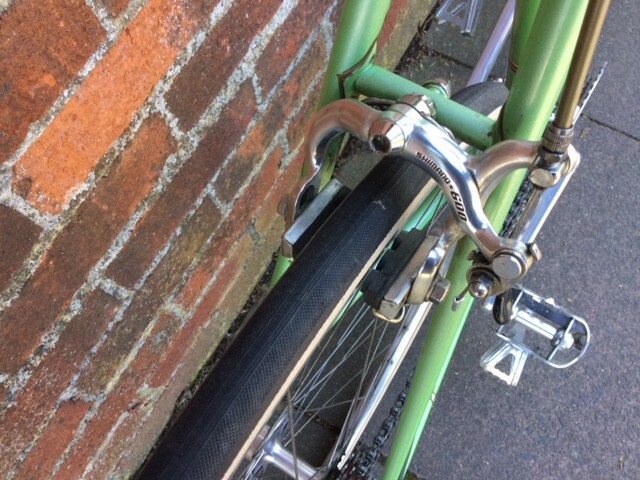 This bike was obviously lightly ridden and well maintained over the years. The hubs cleaned up very swiftly, revealing a handsome set of high flange centrepieces for the wheels. The spacing on the rear hub was 122mm, which made installing the rear wheel into the 120mm rear spacing of the frame a bit of a squeeze. But within a few hours the bike looked sparkling and attractive, it was tuned and lubricated across all its components, ready for a test ride. All seemed to be going well. Initially, the bike at first felt perfect. “What a sweet ride” I thought, as it was quiet, well balanced and actually, very comfortable. However, when I shifted into 4th gear, lo and behold I could feel a slight clicking and creaking sensation coming though both pedals. Crap! Shifting to 5th, I felt it again. It was definitely in those two gears, the 4th and the 5th. The rest, 1st, 2nd, 3rd and 6th were fine, with not a trace of this annoying noise and sensation. My heart sank, because this, as I’ve written about before, is often a difficult problem to pin down, and I was rather deflated to return home having discovered it. “So what was the conclusion?” I hear you ask. Well, I believe this particular issue is one of the most difficult to solve without running through a series of experimental solutions. 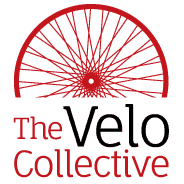 Logically, it seemed to me that it must be the freewheel, as the problem only affected the two cogs, probably used most by the previous owner. Yet, I tested two other rear wheels on this bike, and the problem continued. I’d say then, after all this testing of probable causes, that it was probably a combination of a worn freewheel and chain, combining together to cause this stress noise. Yet, looking closely at both, they seemed in good condition. It is a strange thing. Lovely bike, though.